Gaming chairs come in two distinct varieties. The first, designed for PC gaming, resembles a high-backed office chair with a metal frame that’s mounted on casters, and swivels. The second is optimized for platform systems (X-Box, Playstation, etc.). These resemble loungers or recliners with sleek, futuristic styling, some of which can be quite low to the floor. Both types are designed for extremely long-duration seating with even better lumbar support and greater comfort than the standard office chairs or recliners that inspired them and can feature a number of “extras” such as built-in speakers, cup holders, and the like. 1 What Is a Gaming Chair? As the name implies, these chairs are primarily used for gaming, which means they’ve got to be built for comfort, because as any gamer knows, there’s no such thing as sitting down for “just a few minutes” of gameplay. In fact, several South Korean gamers have died playing games, because they forgot to eat and died from a combination of starvation, dehydration, and exhaustion. Obviously, those are extreme cases, but the point is that gaming is a time-intensive hobby, and a standard office chair or recliner simply won’t cut it. 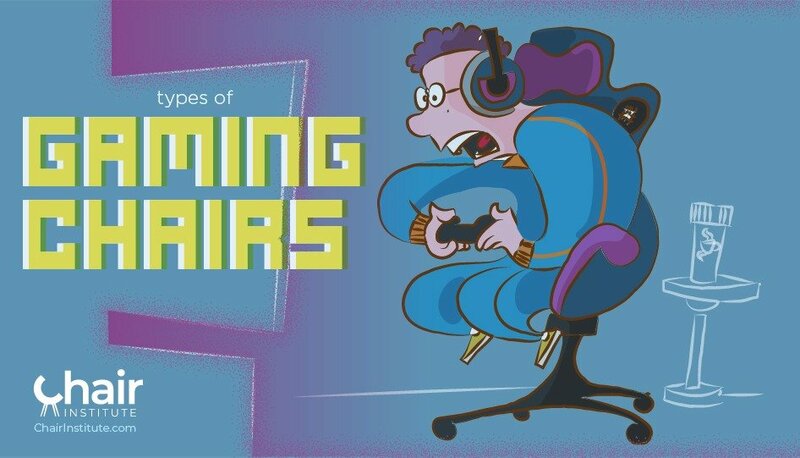 While living room recliners can be enjoyed for six or eight hours at a stretch without causing discomfort, and the very best office chairs are good for a comparable period, gaming chairs tend to be much more comfortable, allowing gamers to sit in them for 12-16 hours, or longer! We mentioned earlier that there were two different types of gaming chairs, each optimized for a particular kind of gamer. That’s because PCs tend to be set up on computer desks, which makes an office chair the perfect base to develop a PC gaming chair from. On the other hand, platform systems tend to be connected to living room television sets, which make recliners the superior choice to base platform gaming chairs around. There is some overlap here, however. A kind of hybrid third category that could technically be used for either type of gaming, and we’ll cover the full details of all three in the next section, along with some interesting variants and sub-types. Given that the go-to choice of seating for knowledge workers everywhere is the office chair, it makes sense that a dedicated PC gaming chair grew from those roots. This first picture is a fairly typical example, and you can see the similarities between this and the standard, ergonomic office chair. While there are some similarities, you’ll also note some key differences, beginning with the fact that the gaming chair has a bucket style seat and extra cushioning. In addition to that, the armrests are height-adjustable, and these chairs offer added lumbar support. Some models even include a small pillow and a recline feature. More advanced models like this one have speakers built into the headrest. Platform gaming chairs are a different animal altogether. Most commonly, these have the general appearance of a recliner but are usually set on the floor like this. If you’re looking for a chair that blends both form and function, then something like this would work quite well for platform gamers, but as you can see simply by the shape of the chair, it would make a poor PC gaming chair. More advanced hybrids like this one come with multiple monitors, built-in surround sound speakers, and a variety of game control mechanisms (note the steering wheel, used to play racing games). If you’re looking for the ultimate in gaming experiences, this chair called the Emperor, is a great example of what’s possible. Obviously, a chair like this isn’t going to fit into everyone’s budget or home aesthetic, but for the diehard gamer, this is a superb option. Gaming chairs trace their history back to the early 1980’s. Three very interesting things were happening at that time, and their convergence is what ultimately led to the creation of the first gaming chairs. First, the personal computer was moving from the exclusive domain of the business world and becoming increasingly common in homes. Second, the first platform gaming systems were created and proved to be wildly popular. Third, the concept of the home entertainment center was gaining traction and becoming a hallmark of middle-class households. The convergence of these three trends led to the phenomenon of “cocooning,” which saw increasing numbers of people spending more and more time indoors, and correspondingly less time interacting with one another outdoors, and it was this phenomenon that led to the development of gaming chairs. As materials sciences and technology have continued to advance, these types of chairs increased in complexity and the number of options available. You can find chairs with cup holders, built-in speakers, massage heads, swing arms that hold monitors, and more. And, as a point of interest, if you’d like to get your hands on the Emperor, here’s the manufacturer’s website: Emperor. Final Note: If you don’t want to limit your thinking to a simple chair, you don’t have to. Some companies also make gaming sofas like this one.